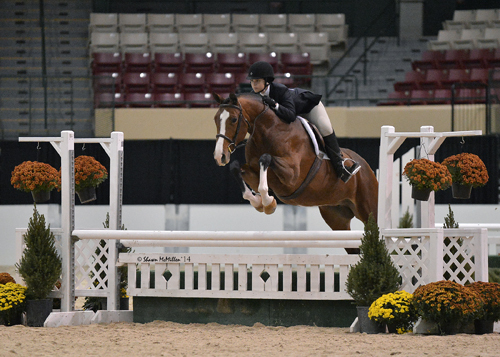 Washington, D.C. – October 20, 2014 – The 2014 Washington International Horse Show (WIHS) hosted its Regional Horse Show in conjunction with the USHJA Zone 3 Finals this weekend on October 17-19, 2014, at Prince George’s Equestrian Center in Upper Marlboro, MD. The competition is a precursor to the 56th annual Washington International Horse Show, which will run this week, October 21-26, at Verizon Center in downtown Washington D.C. The regional competition gives local riders a chance to qualify to compete in the WIHS Championship Finals in the children’s and adult hunter and jumper divisions. The WIHS Championship Finals will feature the $10,000 WIHS Children’s Hunter Championship and the $10,000 WIHS Adult Hunter Championship on Tuesday, October 21. The $10,000 WIHS Children’s Jumper Championship and the $10,000 WIHS Adult Jumper Championship will both be held on Wednesday, October 22. The big equitation win of the weekend went to rider Rachel Heist in the Gittings Horsemanship Finals. Heist rode her horse Cordelanne to victory with the help of trainer Erin Knepper. Second place went Hannah Showell aboard Christine M. Lies’ Rintoo. Emily Simon finished third riding Pembroke Point LLC’s Tribecca. Other equitation divisions in the weekend’s WIHS Regional competition included the MHSA Adult Hunt Seat class, which saw a win for Margot Sanger-Katz riding Paulexi LLC’s Ufonia P. Davina Pruitt-Mentle and Cori Reich’s Dream On finished second, and Carly A. Ziegler placed third aboard Margaret Lebor’s Wicklow. Pruitt-Mentle then went on to win the VHSA Adult Amateur Medal with Dream On. Ziegler rode Cameron Schmitz’s Prime Time to a second place finish, and Amy T. Chandler and Frolich D placed third. In the VHSA Children’s Medal, Michelle Worek guided her horse Louis Vuitton to victory with Peyton E. Ruddy aboard Madison L. Ruddy’s Clair de Lune in second. Ashley M. Johnson finished third riding Espresso. The MHSA Children’s Pony Medal was won by Audrey Pelczar riding Pikachu. Olivia Sorrentino finished second riding Catherine Damron’s St. Elmos Fire. Caroline Benson and Snappy Beat placed third. In the hunter divisions, Laura Flanagan’s First Look earned the championship tricolor in the Adult Amateur Hunter 18-35 Zone Finals with Megan McCann in the irons. Poetic Justis, owned and ridden by Brooke Cole, finished in reserve. 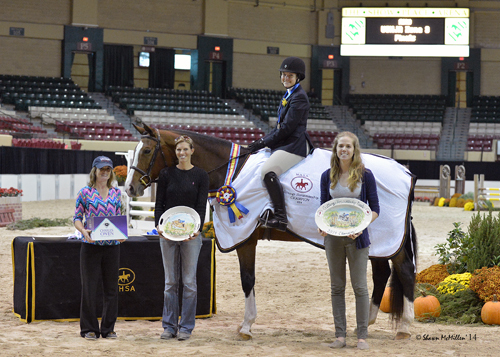 In the Adult Amateur Hunter Over 35 Zone Finals, the championship was awarded to Cello, owned and shown by Nicole Wood. Reserve honors went to Quiet Haven Farm LLC’s Swingtown ridden by Rachel Howell. The Children’s Hunter Horse 14 and Under also hosted their Zone Finals over the weekend with a championship win for Streett Moore’s Oberon ridden by Madeline McManus. Lorenzo and Taylor Morrison finished in reserve. In the Children’s Hunter Horse 15-17 Zone Finals, Kendall Nelson’s Who’s on First? earned the championship ridden by Caitlyn Duzy with Chad Keenum’s Good Measure and Lillie Honiberg in reserve. The Small/Medium Children’s Hunter Pony Final presented its championship to Fleetwood, owned and ridden by Alexandra Hershfield. Falling Moon Huckleberry and Ashley Schneider finished in reserve. The Large Children’s Hunter Pony Zone Final was won by Little Man, owned and ridden by Sydney Johnson. Highland’s Right Royal, owned by Alexandra Panetta, was ridden to the reserve championship by Lauren Katz. In the jumper divisions, the Children’s Jumper Zone Finals saw a win for Cary Hundley and Beste Intentions with Samantha Halo and Airwalk in second and Jillian Kaufman with Double Dutch in third. Wendy Libert won the Adult Amateur Jumper Zone Finals riding John Bartko’s Papillion Peanut with Alexandra Volta and Lover Boy in second. Amy Lee finished third aboard Raspail d’Elle. In the Pony Jumper Zone Finals, Megan De Michele jumped to victory aboard Victoria Hutcheson-De Michele’s Agripin Rudy. Shelby Langlois and Pipe Creek Pebbles finished second. The Low Children’s Jumper Zone Final was won by Lily Gottwald and Verena. Ellie Williams guided Emily Williams’ Valesca to second place honors, and Robyn Miles jumped to third place riding Maristuart Miles’ Ve Y Ve Notable. The Low Adult Jumper Zone Final saw victory for Randi A. Stamp riding Alison Fisher’s Road Rage. Carly Williams and High Hopes finished second, and Ericka Caslin and Charlotte finished third. 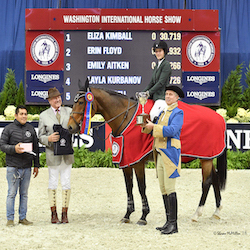 All of the fantastic regional competition in Upper Marlboro, MD, leads up to this week’s 56th annual Washington International Horse Show, featuring many of the nation’s top horses and riders as well as some of the world’s best international competitors. For more information, please visit www.wihs.org, join us on Facebook, and follow us on Twitter and Instagram. For anyone that cannot attend the show in person, WIHS offers free, live-streaming video of the entire event sponsored in part by The Nutro Company. Live-streaming will be available at wihs.org and usefnetwork.com. Tickets to the event are available at Ticketmaster.com or by calling 1-800-745-3000. General admission is $15 Tuesday through Sunday. Children ages 3-12 are admitted free to all daytime performances before 5pm. Reserved and VIP tickets are available for evening performances. Ending times are approximate. For Discounted Group Sales, call 202-661-5061. Tickets also may be purchased in person at the Verizon Center Box Office. Full ticket information can be found by visiting www.wihs.org/tickets/. For those who cannot attend the show in person, WIHS offers a free live streaming of the entire event sponsored in part by The Nutro Company. Live-streaming will be available at wihs.org and usefnetwork.com.